Bulls’ boss Peter Beadle says Monday’s eagerly awaited game with Evesham could be a tremendous occasion thanks to a near sell-out crowd, and a derby-like atmosphere. “Paul Collicutt has put together another good side, as he did last year, and the season before. For whatever reason they’ve seemed to fall away a little bit at the end. But they are strong and organised, and have plenty of goal scorers in their team, so we are expecting a tough match but one that we will all relish,” said Beadle. “It’s a game we are all looking forward to. We know what to expect and we will prepare as we always do, and we’ll be looking to win the game. “I went to see Evesham lose at home to Shortwood on what looked a good pitch. Both teams threw everything at it and both sides were well organised. The game could have gone either way, but in the end Shortwood ran out winners with a piece of quality from a set piece. “It’s always worthwhile taking a look at your opponents and I feel Evesham have strengths and weaknesses, like most teams, but we’ll be hoping to get at them”. Clayton Fortune and Jamie Molyneux have both been sidelined with injuries recently but both could yet feature. “They both seem to be fine. Jamie has made an exceptionally quick recovery and was on the bench at Bishop’s Cleeve. Clayton too will probably want to play but as I’ve said before it’s better to have players back 100% fit, rather than risk them at 60 to 70%”. Evesham will be without the Gloucester City loanee, Leroy Odiero, as he is carrying a two-match ban following a red-card incident at Didcot Town. Midfielder Joe Turley has also been ruled out for up to six weeks after damaging knee ligaments. Top scorer Lance Smith will pose a threat for the Robins alongside Liam Harding, Lewis Binns and Nick Stanley who could all play against the Bulls. Smith turned down an opportunity to join Hednesford Town earlier this season eventually deciding against the move. “Lance is a local lad and the crowd think the world of him, said boss Collicutt. 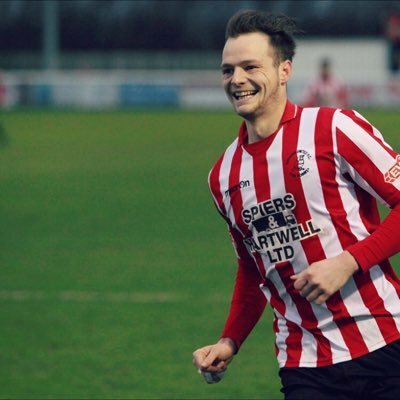 Collicutt has boosted his squad in recent weeks with the arrival of winger Garyn Preen, 25, on a month’s loan from National League South Hungerford Town, and Cheltenham-based British Army captain Ryan Paddock. Paddock, formerly with Bishop’s Cleeve and Cinderford can feature in defence or midfield, whilst Preen has youth experience with Cardiff City and Burton Albion. More recently the winger has played for Salisbury, Merthyr and Cinderford Town. “It’s a massive game for both teams on Monday,” claims Collicutt. “When we played Salisbury a month ago, I told the players that was a huge game but this match is even bigger”.